The stunning cotton-headed tamarin is one of South America’s most endangered primates. Habitat destruction has put these little creatures on the brink of extinction in the wild. With the remaining populations now closer to humans, they are also vulnerable to poachers of the pet trade. 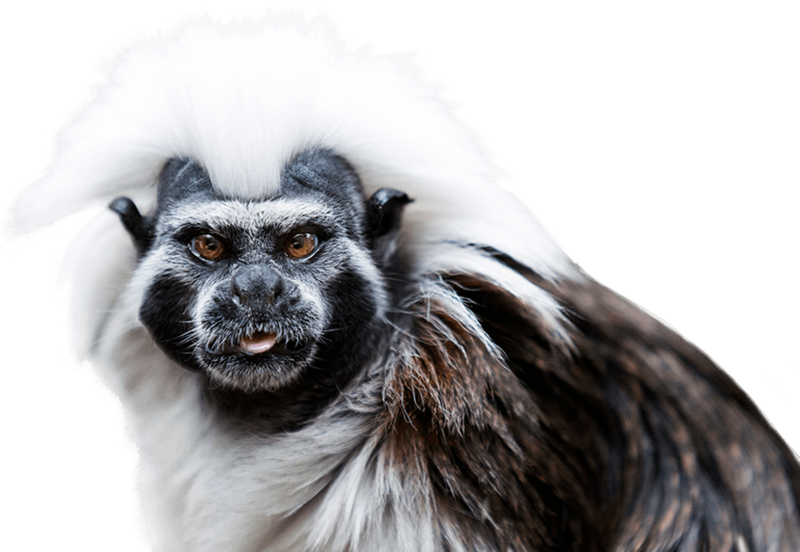 Cotton-top Tamarins communicate with each other via bird-like whistles, soft chirping sounds, high-pitched trilling, and staccato calls. They have a repertoire of 38 distinct sounds and research has shown that each call is associated with a different message. They also make faces and use body language to express emotions like contentment, surprise or fear: they move their lips, eyelids, ears, and the hair around their faces. When alarmed or excited, Cotton-top Tamarins raise the hair on the crown of their head and stand up tall to make themselves look larger. The National Zoo & Aquarium is home to 7 Cotton-top Tamarins who are part of a national breeding program.